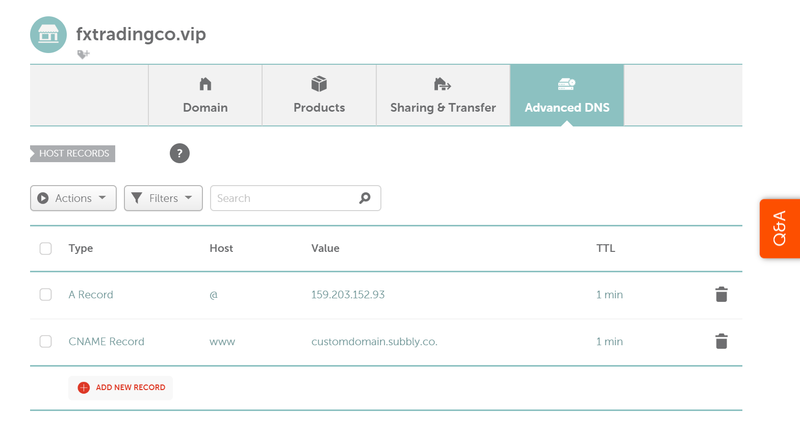 How do I connect my custom domain to Subbly? Login to your custom domain's DNS settings (where you bought your domain initially). You should be able to change records on your DNS (specifically A and CNAME records which are essential here). Create A RECORD with the value of ''@'' and pointing to '' 159.203.152.93 '' (without the quotation marks). Create a CNAME RECORD with the value of ''www'' pointing to ''customdomain.subbly.co'' (again, input the values without quotation marks 🙃). Make sure to get rid of all the additional A or CNAME records (just delete them) possibly present on the control panel. At the same time, please disable any forwarding that you've might added previously. Go here and input your custom domain into appropriate field and save. Of course, you can still consider adding SSL certificates to your custom domain if you want your entire site to be secured. We advise adding Cloudflare's certificates. Majority of our customer choose GoDaddy for their domain registrar. Changing DNS settings on GoDaddy is pretty straightforward. You'll need to go to Domains page on your GoDaddy admin and to click on DNS. If you bought your domain on Namecheap, you will first of all need to make sure that you're using Namecheap's default basic DNS nameservers. Once you're using Namecheap's nameservers you'll be able to navigate over to the Advanced DNS tab where you need to make appropriate changes to the A and CNAME records. Correct Namecheap DNS records should look like in the picture below. How do I setup SSL on my domain name? How can I change the language of my store? How do I setup a landing page on Subbly? How do I put my store’s visibility on and off? How do I add Terms & Conditions to the checkout? How to connect a domain to your website? How to connect your custom domain and add SSL via Cloudflare? How to purchase a domain through Subbly?